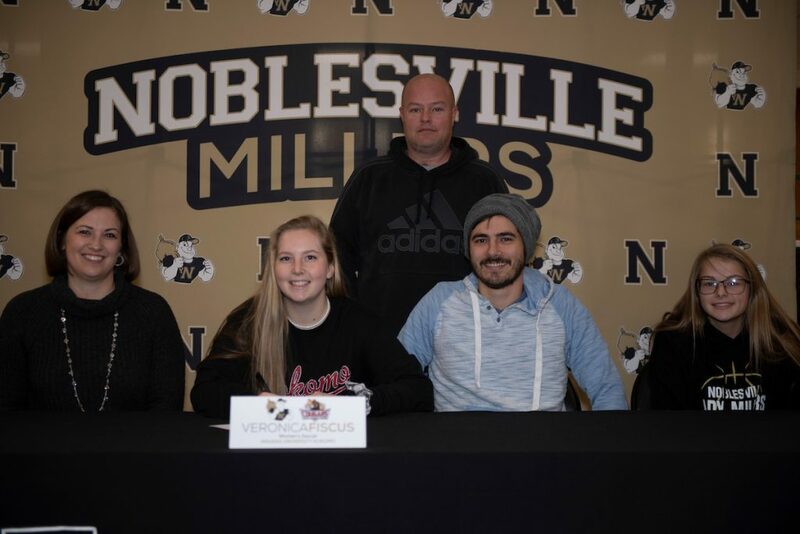 The Noblesville Athletic Department hosted its annual Winter Signing Day on Friday afternoon at Noblesville High School. Six student-athletes were joined by family, friends, and coaches to celebrate their college decisions. In an effort to spotlight these student-athletes, we asked them to explain how they made their decisions as we give you a brief glimpse at the young men and women who will forever be Millers. Chris Bostrom, Football. Concordia University Ann Arbor. 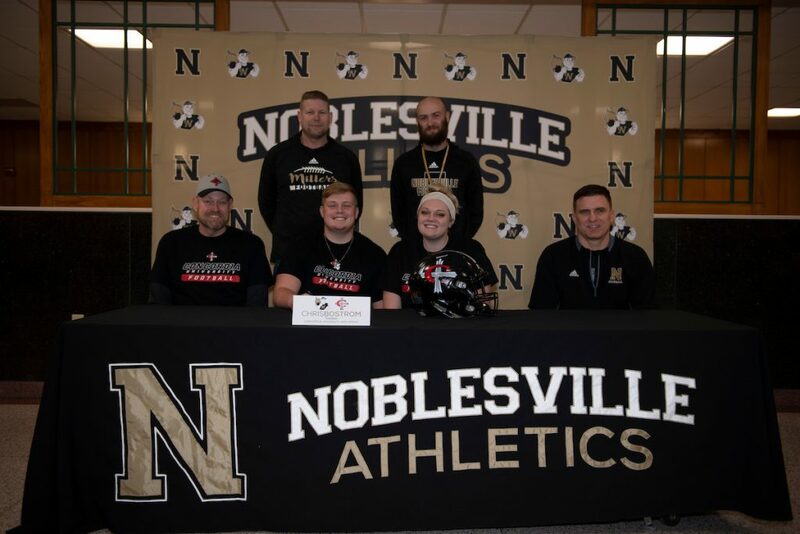 Front Row (Left to Right): Brian Bostrom (Father), Chris Bostrom, Courtney Bostrom (Sister), Adam Metzler (Noblesville Football Assistant Coach). Back Row (Left to Right): Paul Stinn (Noblesville Football Assistant Coach), Robert Konkoly (Noblesville Football Assistant Coach). Not Pictured: Justin Roden (Noblesville Football Head Coach). Why I Chose My School: The recruiting process is extremely crazy and stressful; having multiple schools contacting you after every game, sending you letters, and coming to school to talk to you makes it very hard to try and find a new home. One school stood out above all the others: Concordia University Ann Arbor. They constantly stayed up to date with everything that was going in on my life and the coaches genuinely cared about my well being. Not only did I love the football program and the coaching staff, they even had my dream major of Secondary Education Integrated Sciences. The second I stepped on campus for my official visit, I knew Ann Arbor was my new home. The town of Ann Arbor and the campus is absolutely beautiful and the small campus made me feel like I would actually be a student rather than a number. How I Want to Get Involved: I can’t wait to continue playing the sport I love. College Football is sometimes a full-time job, but I plan on finding a job for the offseason. I wish to become a high school football coach, so I plan on taking some leadership roles while I’m attending. My plan as of now: I would like to get my graduate degree from Concordia’s graduate school. My Biggest Inspiration: My biggest inspiration is my Dad. Since third grade, he has come to every game I had, even if I wasn’t going to play. For the past two years, he has driven me around the midwest to camps so I could show off my abilities to colleges in hopes of a scholarship. After the games that I didn’t play so well, he would tell me to look at what I did wrong and not to make the same mistakes again. After every high school game, I would go out and grab something to eat with the team and sometimes wouldn’t get home until midnight. Every time I walked through the door, he would be waiting on the couch to talk about the game. My family has been through a lot over the past five years and my dad has been my rock. He was there for me for everything that I was going through and he kept me on the right path to success. Without him, there’s no way I would be where I am at today. Dad, I appreciate everything you have done for me; I love you. I Would Like to Thank: First off, I would like to thank God for giving me the opportunity to continue playing the sport I love and to receive a college education at the same time. I would like to thank my family for the countless amount of hours they spent on me so I could be where I’m at today. I would like to thank Anthony Morelli (my trainer) for training me and motivating me to become the best person and athlete that I can be. I would like to thank Coach Roden and the Noblesville coaching staff for helping me become a better player and helping me through the recruiting process. Last but not least, I would like to thank the Concordia University Ann Arbor football staff for giving me this amazing opportunity and for trusting me and my abilities. Dalton Davis, Football. University of Findlay. 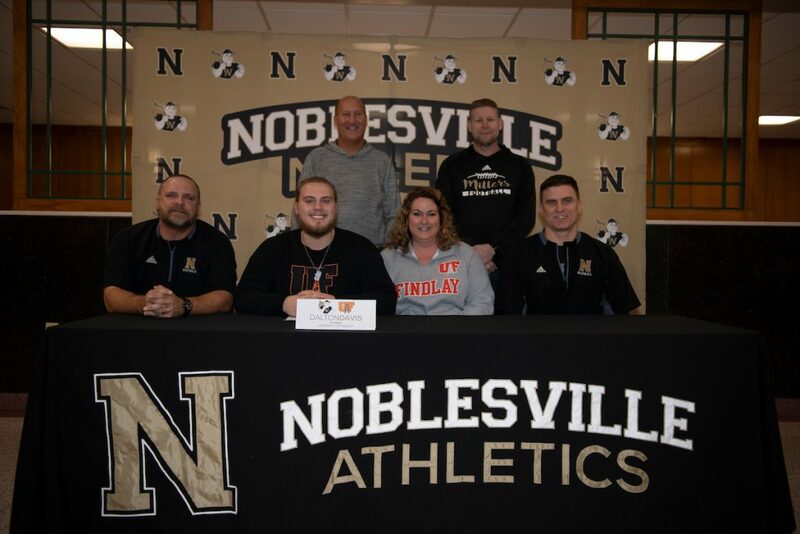 Front Row (Left to Right): Robin Davis (Father), Dalton Davis, Annie Davis (Mother), Adam Metzler (Noblesville Football Assistant Coach). Back Row (Left to Right): Lance Scheib (Former Noblesville Football Head Coach), Paul Stinn (Noblesville Football Assistant Coach). Why I Chose My School: I chose Findlay because after my first visit I could tell it was the right fit for me. It felt like home, and I immediately could see myself spending four to five years there. I loved the city, the school, and the football program. How I Want to Get Involved: I want to get involved with Special Olympics or special needs athletes in some way; this has been a passion of mine throughout high school. I look forward to finding a way to make this happen and maybe pursuing it after college. My Biggest Inspiration: My biggest inspiration is Zack Reising. Despite the adversity he has faced in his life he constantly brings a positive attitude into whatever he is doing. Zack tells me that I helped him grow, but little does he know that he has taught me endless lessons that I will use forever. Being friends with Zack has made me a more humble and successful person; thank you, Zack. I Would Like to Thank: I would like to thank my mother for always being my rock. She is always there for me when I need her, and has never TO THIS DAY let me down. I would like to thank my dad for always being able to tell me things that I might not want to hear, but need to hear. Because of him, I am as tough and successful as I am today. I would also like to thank all of my family and friends that have surrounded me in my adolescent years. You all have had a bigger impact on me than you know. To all my peers out there, thank you for welcoming me into the Noblesville family in eighth grade without even batting an eye. To my family out there, thank you for always supporting me whether it be by sitting in the terrible weather to watch me play or by being there when I needed support. Without my family and friends, I would not be who or where I am today; THANK YOU! Veronica Fiscus, Women’s Soccer. Indiana University Kokomo. Front Row (Left to Right): Shelby Fiscus (Mother), Veronica Fiscus, Gaige Guire (Brother), Victoria Cook (Cousin). Back Row (Left to Right): Dayne Cook (Uncle). Why I Chose My School: I chose IU Kokomo because I’m excited to be apart of the first ever women’s soccer team. I also like the vision the school has for the years coming and the school’s commitment to providing students with the absolute best they have to offer. How I Want to Get Involved: I look forward to joining KEY, a program that allows you to travel to different places so that I’m able to immerse myself into the real world and learn not only in the classroom but also with hands-on experience. My Biggest Inspiration: My coaches, teammates, and parents have all inspired me. I’ve been so close to quitting, but every one of them pushed me to be the best player I could be and never let me give up. I Would Like to Thank: I would like to thank my parents for supporting me throughout my years of soccer. They got me the extra training when I needed it and sacrificed so much of their time for practices, tournaments, and games. Without them, I would never have the opportunity to play college soccer. I would also like to thank my coaches and teammates for always believing in me even on my bad days. Kenja Jenkins, Football. Tiffin University. Front Row (Left to Right): Nick Frederick (Father), Grace Frederick (Sister), Kenja Jenkins, Joni Frederick (Mother), Caylee Frederick (Sister). Back Row (Left to Right): Robert Konkoly (Noblesville Football Assistant Coach), Paul Stinn (Noblesville Football Assistant Coach), Adam Metzler (Noblesville Football Assistant Coach). Why I Chose My School: I chose Tiffin mainly because of the coaches; they really made me feel like I was at home when I went there. They really welcomed me and made me feel like I was going to be taken care of as long as I put in the work on my end. How I Want to Get Involved: I really look forward to helping out the community in any way that I can. I know that in the past I’ve done community service around Noblesville and it really just feels good helping others that need the help. My Biggest Inspiration: My mom is my biggest inspiration; she’s been through a lot and goes through a lot every day. It’s not easy to be a mom of six kids, but she never fails to put food in our stomachs and clothes on our backs. Seeing what she’s been through and how she still has a smile on her face every day, it really shows me that no matter how hard things get, that I can and will keep going. I Would Like to Thank: I’d really like to thank my parents because they’ve just been there with me throughout my whole journey. I’d like to thank all of my coaches for guiding me and molding me into the athlete I am today. 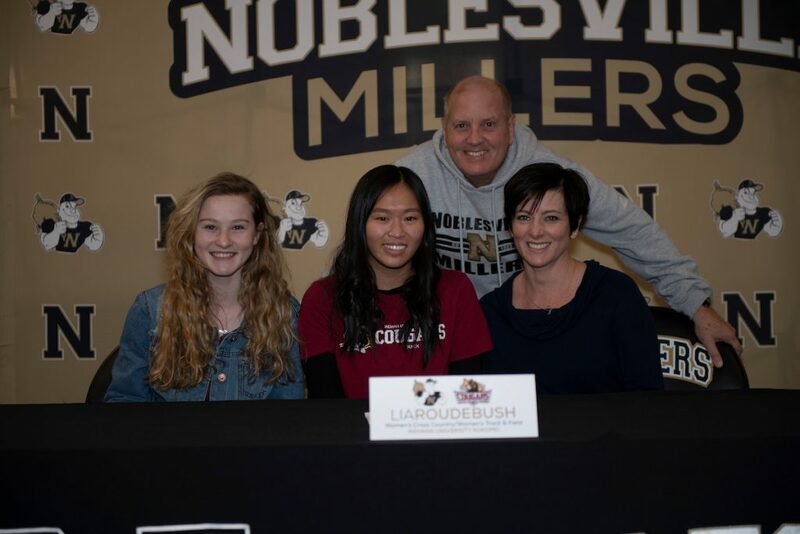 Lia Roudebush, Women’s Cross Country and Women’s Track & Field. Indiana University Kokomo. Front Row (Left to Right): Brynn Roudebush (Sister), Lia Roudebush, Shannon Roudebush (Mother). Back Row (Left to Right): Dennis Scheele (Noblesville Girls Cross Country and Track & Field Head Coach). LIA ROUDEBUSH, WOMEN’S CROSS COUNTRY AND WOMEN’S TRACK & FIELD. Why I Chose My School: While looking at colleges, I visited IU Kokomo just to see what the campus looked like and just to get a feel for the different types of campuses that exist. After that first visit, I really began looking into all that they had to offer with one of their more renowned areas of study being business. Shortly after, I went to a VIP visit day where I got to meet some of the administrators and multiple professors. IUK had some of the most welcoming, friendly, and accommodating staff out of all of the universities I toured thus far. A few weeks later I found myself on campus yet again for an interview for a variety of scholarship opportunities. While there, I also got to talking with one of the cross country coaches about the program. Prior to this, I was not really planning on pursuing running in college but that conversation changed my mind. 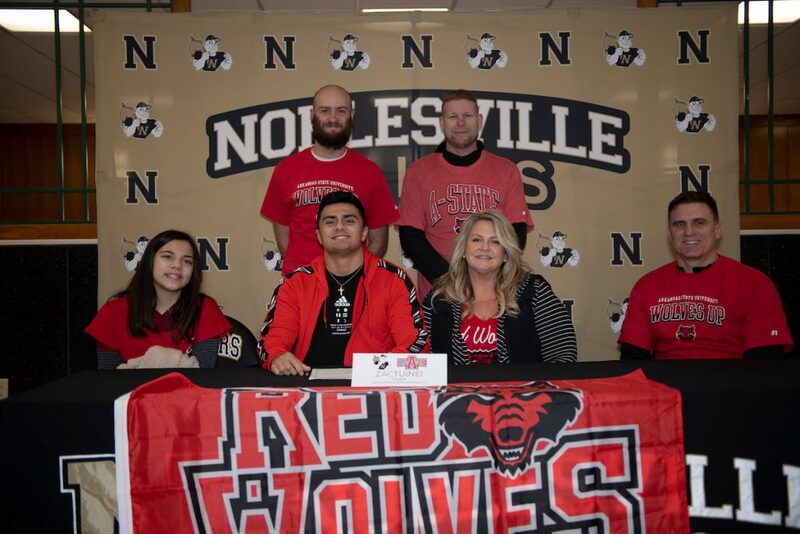 Fast forward a few more weeks, I was surprised here at NHS by a few representatives & the head coach with Herbert Presidential Scholarship: a full ride scholarship for all four years. After that day, my decision was more or less made for me. IUK was able to offer me everything I was looking for in a school and more. How I Want to Get Involved: While I’m really looking forward to running for the Cougars next semester, I do have plans to get involved in as many extracurriculars as possible, especially during my freshman year. The university has a variety of clubs, including many related to business as well as a KEY program I am particularly interested in. With my scholarship, I was also awarded a small sum of money for traveling abroad which I hope to use when the time comes. At the end of the day, I just want to take as many of the opportunities to get involved and really make the most of my experience at IUK. Zac Tuinei, Football. Arkansas State University. 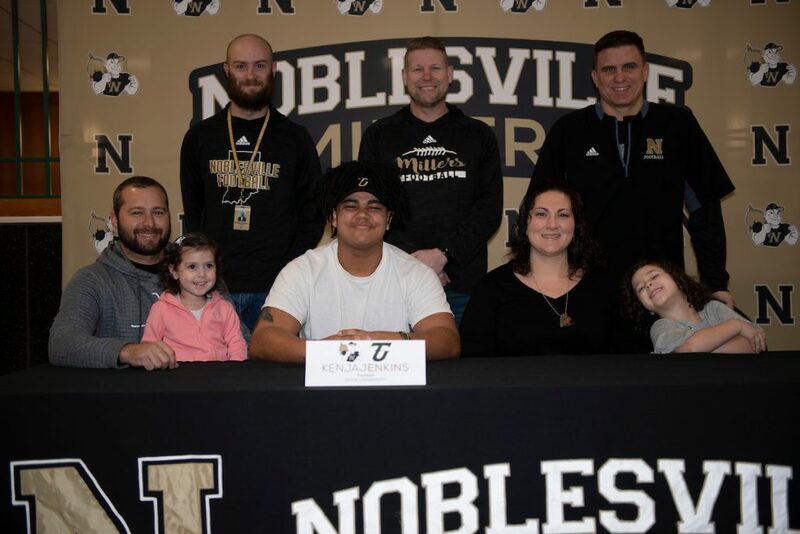 Front Row (Left to Right): Izzy Tuinei (Sister), Zac Tuinei, Jane Tuinei (Mother), Adam Metzler (Noblesville Football Assistant Coach). Back Row (Left to Right): Robert Konkoly (Noblesville Football Assistant Coach), Paul Stinn (Noblesville Football Assistant Coach). Why I Chose My School: I took my official visit to Arkansas State University and it felt like home. I loved the school, the facilities, and the coaches, but I chose Arkansas State because they were the first school to take a chance on me playing Division One football. My Biggest Inspiration: My dad and my brother are my inspirations. Growing up I wanted to be just like my dad and my brother. They still motivate me today as I chase to be just like them. I Would Like to Thank: I want to thank God for giving me the abilities to play football at a high level. I also want to thank all of my coaches helping me through this process. Most importantly I want to thank my parents for making the sacrifices they did to follow my dream.